Bushman AvonTec, Milwaukee, WI, has developed a coil grab designed for handling densely packed slit coils. The unit features an adjustable coil lifter with flexible lifting legs that fit between the coils and rotate into the ID for a safe lift. 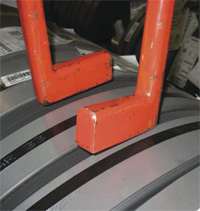 When CoilPlus-Berwick Steel, a flat-rolled steel-service center in Columbus, OH, needed to find a to insert and remove thin slit steel coils (down to 1 in. wide) from a storage rack, the new Bushman AvonTec coil grab fit the bill. 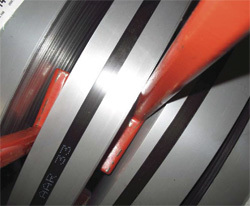 The coils are closely stacked in the rack with a narrow 1.5-in. space between them. To remove a coil, the hooks are lowered with the feet parallel to the coils. Once the feet are in the ID of the coil, they turn 90 deg. so they can lift the coil without damaging it or neighboring coils.